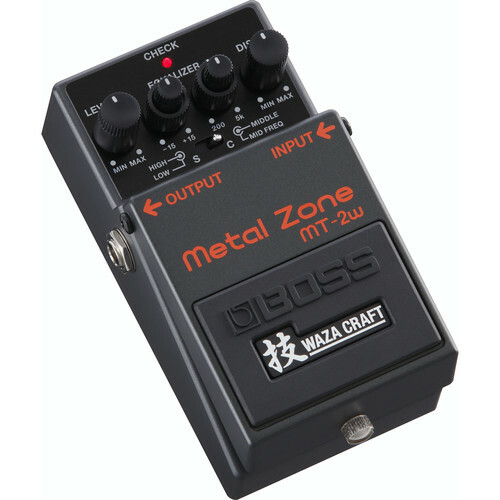 A part of their Waza Craft series, the BOSS MT-2W offers two different distortion tones in one stompbox. The first is the sound of the standard MT-2—a hefty, thick distortion with midrange character and heavy tones. This distortion comes with a three-band EQ with parametric midrange for much in the way of tonal shaping. This equalizer features concentric knobs in the EQ section to keep the footprint of the pedal as compact as possible. You'll notice that this pedal's Standard mode has a more responsive and more clearly defined sound compared to the MT-2, with lower noise for improved performance at the highest gain settings. The second mode, Custom, provides a more natural, open tone, with more dynamics and a rounder feeling to the low-midrange. This distortion also cleans up nicely when rolling off your guitar's volume, which increases its functionality. This pedal is very much in line with the metal tones being achieved today. As with all Waza Craft pedals, the MT-2W preserves the original design while enhancing aspects for increased reliability and versatility. A dual-stage gain path utilizes discrete circuitry to give you a bolstered tonal clarity. EQ has been refined too, offering bandwidth values tuned specifically for both of the pedal's operating modes. The pedal provides 1/4" mono I/O. It can be powered from the included 9V battery or by means of a separately available power supply.